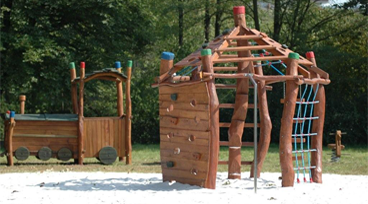 We are very proud to offer these wonderfull and long lasting playgrounds. 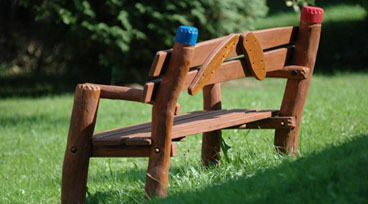 All items are produced in the Czech Republic by our partner Robinia Bohemia. The timber used is mostly Robinia (Acadia) which es the most resistant timber against mould, decay and insects. Because of this no chemical treatment (poison) is neccessary to make them last for a long time. This means 100% natural playgrounds to make you and your children happy. 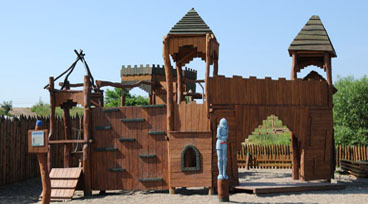 We supply almost endless possibilities for your children to have fun. All are made out of Robinia the most long lasting timber we have in Europe. Design your own playground. Castles, forts, ship wrecks, railway stations, everything is possible. Use your imagination. Robinia Bohemia offers a wide range of outdoor furniture made out of Robinia. They are rustic, long lasting and great to sit, use and look at.